The Greek word for "anguish" is "agonia" from which we get "agonize." Jesus was in agony as he contemplated what would happen the next day. 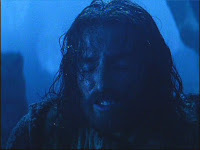 Here’s my question, “Why was Jesus in such agony?” Well, duh! He was about to die a horrible and painful death! He knew what would happen the next day. But there is more to it. During the reign of Emperor Severus in the third century, a young woman from Alexandria named Potamiaena was condemned to die as a Christian. She underwent days of torture and abuse before eventually being burned alive by having boiling pitch poured over her body. And yet her faith and disposition while awaiting and enduring her horrible death led her jailer to Christ. This young girl and thousands like her faced martyrdom in horrible ways in the name of Christ with a calm faith and quiet acceptance. So why did Jesus claw the ground in Gethsemane? I am not suggesting that we minimize the physical torture Jesus endured; it was every bit as horrible as we saw in Gibson’s movie. But how did so many martyrs face their own horrible deaths with quiet calm and serenity? What Jesus faced on the cross was more than just the pain of physical crucifixion. Jesus would carry our sin with Him on the cross. Jesus would feel the desolation of separation from God caused by our sin. That was the meaning of Jesus cry from the cross—“My God, my God, why have you forsaken me.” Because of our sin, God said “No” to Christ's Gethsemane prayer for deliverance. Because of our sin, God allowed His son to die rejected and alone. The veil in the Temple was not the only thing rent when Christ died; the perfect unity between Father and Son was also rent, torn apart by the rebellion of our sin. So here is the irony. Paul says, “God was reconciling the world to himself in Christ” (2 Cor. 5:19). God was bringing us back to Himself through the cross, but in order for Him to do so, He had to abandon Jesus on the cross. God “made him who had no sin to be sin for us” (2 Cor 5:21). Because in that one moment in time Jesus became our sin, then in that one moment in time, God turned away from Him. In order for us to be reconciled, God rejected His Son. During those dark hours on the cross, Jesus was all alone. Why had God forsaken Him? It was because of our sin... and because of our salvation.